Find us on Google+ Rick and JoAnne's RV Travels: Families + Fun = Wonderful Memories! 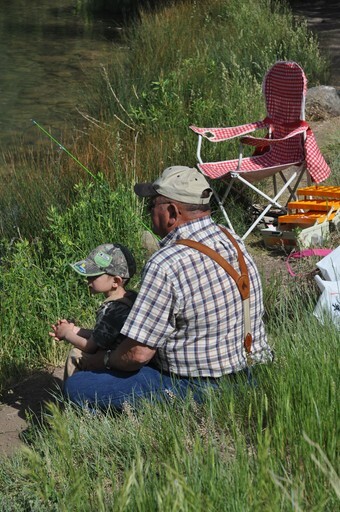 Who knew there were so many single moms and dads who come to Ridgway State Park to camp with their kids? I knew there were some, but always felt the majority of campers were families with mom’s, dad’s, and the kids. However, that’s not the case. We have seen and met some remarkable people, but to see the joy the “family unit” has camping (no matter what the definition), warms your heart. This past weekend was Father’s Day weekend. We were amazed at the “family campers” who camped here were moms with their kids, dad’s with their kids…and dad’s who just wanted to spend some real bonding time with their kids alone – without the mom. What beautiful memories! Ridgway State Park not only provides all of the amenities for families to enjoy their camping experience, they encourage it! Some of our volunteers love to help with this event. Love all the wonderful stories and pictures. Lots of love! Thanks Nea - can't wait to see your CA photos...maybe a blog?